This sinful coffee drink from Almost Supermom is the perfect indulgent treat that can also double as an afternoon pick me up. 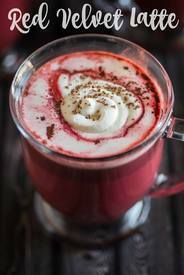 It’s a delightful coffee twist on a classic red velvet hot chocolate and it’s a crowd pleaser for sure! When your kids, your boss or just life is getting you down, just sit in a quiet room and sip yourself into a glorious red velvet coma. Serenity has never tasted so good!